EMT Gel for dogs is your canine "First Aid Kit in a Tube." Today we are looking at EMT gel. This is one of my favorite wound care gels. It's a great addition to any first aid kid. Some of the first aid kits that we sell actually include it. This is great. It's a topical. It's good for hot spots, cuts, any open wound. It is a sticky gel. You put a real thin coat on it. and, basically, what it does is it covers up the wound. It will help reduce bleeding. It helps with pain. And it promotes the healing of any type of skin wound. We've used it for a long time and it is a great product. Not a bad idea to stick in in your vest. It just helps with any open wound on a dog. Just a great, great, great product. I highly recommend it. "I have used this product on my Police K9 Arcos for cuts, lacerations,and scratches, and distribute it to the other handlers in the unit for their first aid kit." This product is a great healing agent. I have used this product on my Police K9 Arcos for cuts, lacerations,and scratches, and distribute it to the other handlers in the unit for their first aid kit. Would recommend for all dogs. "We put the gel on them at night. By morning the dogs are good to go for another fun day of hunting!!" Black Labs. Hunts. Family pet. Competes. My husband & I have been using EMT Gel for several years now. It's great!! Our dogs love to hunt pheasants & chuckkars among other birds. Their faces, paws/pads, legs, inside of their thighs & pretty much the entire underside of their bodies are rubbed raw & are bloody. We put the gel on them at night. By morning the dogs are good to go for another fun day of hunting!! The EMT Gel's also great to "glue" a cut back together & stop the bleeding.
" I immediately ordered some and in 2 days, her ear started to heal. I couldn't believe it. In 2 weeks it was fully healed up after 9 months of trying everything." EMT is THE BEST thing ever. My female Boxer had a tear on her ear from a dog that bit her at doggie day care. For months we could not get it to heal. We tried everything. Expensive prescription medications and everything out there. You name it we tried it. I came across your website and called up and spoke to Steve. I couldn't believe it when he told me EMT gel would work for my girl. I immediately ordered some and in 2 days, her ear started to heal. I couldn't believe it. In 2 weeks it was fully healed up after 9 months of trying everything. I SWEAR by EMT gel. I run a non-profit Boxer rescue and I have recommended EMT gel to so many people and everyone agrees, it's THE BEST!!!!! "It's a great way to stop the bleeding, disinfect and speed healing." EMT Gel is an excellent product! Anytime either of my hounds have a scratch or cut, it's a great way to stop the bleeding, disinfect and speed healing. "Very impressed with the results"
I have used it a number of times on lacerations and have been very impressed with the results. "Vet was amazed at how good the open gash looked next morning when we got in to have it stapled." The tube arrived just in time to be used on a hernia repair incision that stitches had broken loose from 5# dog jumping up onto bed. Vet was amazed at how good the open gash looked next morning when we got in to have it stapled. "Worked well on our lab's hot spots." Worked well on our lab's hot spots. Works great! I never want to use it, but works great every time that I have to use it! "Put EMT gel over the wound and it sealed up very nicely." English Cocker Spaniel,Black Lab. Hunts. Family pet. Competes. Was on a week long hunt in North Dakota. My brother's dog had a run in with a barb wire fence. Nearest vet was over an hour away and after cleaning up the wound (4 inch long cut) we needed to get the bleeding stopped. Put EMT gel over the wound and it sealed up very nicely. Another story, hunting pheasants out in Colorado and my dog comes out of the field with blood everywhere. I look over the dog and finally come to the realization that the blood is coming from a pad. I think my day is over as I can't get the bleeding to stop. I pull out the EMT gel and apply it to the paw (after cleaning it up) and the bleeding stops. I even stop a couple of times on the way home to hit a couple of short hunts and no blood! "Used twice with excellent results. I highly recommend carrying a tube with you hunting." Used twice with excellent results. I highly recommend carrying a tube with you hunting. Fixed a bad barb wire slash that I thought would require stitches but it was a Sunday so tried the EMT gel and by the next morning it was looking so good I didn't bother going to the vet. "I have used the EMT gel and spray on cuts on my dogs with great success." German Shepherd,Mastiff,Australian Shepherd. Family pet. I have used the EMT gel and spray on cuts on my dogs with great success. My mastiff wears a prosthetic leg and I used the product to help heal some sores on her shortened leg as she became use to wearing her prosthetic, it really worked well. "It is fantastic. Cuts down pain, stops bleeding, covers burned areas... I can't say enough about this." This is like having a hospital emergency room in a tube. It is fantastic. Cuts down pain, stops bleeding, covers burned areas... I can't say enough about this. I keep a tube in each car's first aid kit and a couple of extra at home. I will not be without it! "Really seemed to speed up healing." Really seemed to speed up healing. Brittaney,Bassett,and Cross. Hunts. Family pet. "Wounds treated with EMT gel heal faster and more cleanly." EMT Gel is easy to carry and easy to use. It lessens bleeding in simple wounds and seems to be a pain reliever. Wounds treated with EMT gel heal faster and more cleanly. I love EMT Gel. Works great on some cuts and abrasions, but really depends on where the wound is located and the type of wound. If in doubt though folks should still consult with their vet. "Every hunter should carry one or two." Every hunter should carry one or two. "Anyone that hunts shouldn't leave home with out their EMT Gel. Best item in my first aid kit." Anyone that hunts shouldn't leave home with out their EMT Gel. Best item in my first aid kit. "Keep one on the truck at all times." Great product. Keep one on the truck at all times. "Does the job on wire cuts and thorn cuts to seal the wound if the dog can't lick it." Does the job on wire cuts and thorn cuts to seal the wound if the dog can't lick it. The dog will lick the EMT and remove some if reachable. "Almost a first aid kit by itself." Almost a first aid kit by itself. "A must have in your training bag." A must have in your training bag. My small terrier had a puncture wound under his armpit. The vet didn't think a stitch was necessary, but it didn't heal and close. I put EMT on the wound, and it closed up and healed within 3 days of repeated application. Great stuff. I've recommended it to friends. "EMT First-Aid Gel, in combination with absorbent cotton and Tensoplast Elastic Adhesive Bandage, no more bruises!" Can't believe how much I use it and how well it works. Helps nicks and dings from barbed wire to cut/torn pads to heal faster and gives them some protection. Although I have both the EMT spray and gel, I like the gel much better. Haven't used it yet and hope I never have to use it. But it has excellent reviews and should be carried in the first aid kit. Worked as you said it would. It worked beautifully. Curtis healed only using one application. I would highly recommend this product. EMT is great stuff. Apply it to your dog's wound and you'll see a different the next day. Great product. Easy to use! This was an injury to the edge of the ear where it is hard to control bleeding. This worked completely well, and my dog was very comfortable. I was totally satisfied. "EMT is great for bringing the blood flow to a stop quickly"
English Setters. Hunts. Family pet. I still carry an old sock in my pocket when hunting to act as an "ace" bandage around the head and ears when the dogs get those floppy ear tears. The blood goes everywhere when they shake their heads. But, the EMT is great for bringing the blood flow to a stop quickly. I carry a tube in my hunting jacket pocket .... always! "Glad I have it in my first aid kit"
Haven't had to use it much, but works great and I'm glad I have it in my first aid kit. "The small price relative to a high Vet bill down the road is well worth the money!" I have used EMT Gel to close small wounds my dogs have sustained in the field while competing or hunting. It has always stopped the bleeding and allowed the dogs to continue to hunt. This also prevents debris from entering an open wounds while in the field and reduces the chance of infection post hunt. It is an excellent product I always carry with me in the field and in my truck, I highly recommend it, the small price relative to a high Vet bill down the road is well worth the money! "Using this product has saved a hunt"
Using this product has saved a hunt, I patched up my dog and did not have to leave early to find a vet. "No first aid kit should be without it." Life savier for your best buddyNo first aid kit should be without it. "Good product with no complaints." I keep this in a jacket pocket, should my dogs get hurt working livestock, tracking, swimming, or general roughhousing. When they have gotten paw scrapes, cuts from barbed wire, or some other open wound, this gel has been useful for a patch-up job in the the field before the long trip back home to the vet. Good product with no complaints. "Wounds heal so quickly it's unbelievable!" I love the EMT spray. The gel can be difficult to use when it's a hard to reach spot, however, great for larger, easy to reach wounds.. I have a retired racing greyhound and with their thin skin they are always hurting themselves. I recommend it to all my greyhound friends. Wounds heal so quickly it's unbelievable! "Helps clot blood in open cuts quickly." Deutsche Draathaar. Hunts. Family pet. A must have for any field dog's first aid kit (and good for hunters too). Helps clot blood in open cuts quickly. "Happy to have it in the first aid kit." Fortunately we haven't had much call to use this product...but when we do it works quite well. Happy to have it in the first aid kit. "i liked that once it sets up it provides a protective coating on a old injury that the hair did not grow back on the rear paw, otherwise it would leave the area raw due to the cover in the field." i liked that once it sets up it provides a protective coating on a old injury that the hair did not grow back on the rear paw, otherwise it would leave the area raw due to the cover in the field. "It's a must have in your first aid kit." It's a must have in your first aid kit. I've used it a few times for emergencies and came in very handy. "Have not had to use it, thank God!" "It helps speed up the healing time and prevent infection." black labrador retreviers. Family pet. The EMT gel is great for superficial wounds. It helps speed up the healing time and prevent infection. My dogs like to lick everything so you have to be quick with wrapping with vet wrap to keep the product on. I would definitely recommend that anyone who has active dogs have this product in their first aid kit. "Stops the bleeding almost immediately." Awesome product. Stops the bleeding almost immediately. "We carry this with us at all times as injuries in the field can happen when you least expect them." ESS. Hunts. Family pet. Competes. We carry this with us at all times as injuries in the field can happen when you least expect them. Have used it more than once on cut pads. Well I ordered it for my husband, Virgil, but we had that stuff for a long time. We thought it did a good job. In fact Virg was looking for it just a few months ago and we had used it all up. The dogs beat the end of their tails up, so it did seem to help. "I have used the product on several occasions and find it to be very helpful." I have used the product on several occassions and find it to be very helpful. I work my dogs hard during the season and training during down time. My male tends to go through things in lieu of going around. He looks like a train wreck by the end of the season. It is pretty sticky, easy to carry in a cannine kit and kills the bacteria while helping to heal the wound. My dogs have not had any infections and or gotten sick from licking it off the wound. I have used it most often on cuts to the paws and pads. "I don't go in the woods without EMT gel." German Shorthaired Pointer. Hunts. Family pet. Competes. I have fortunately only needed to use it on small ear tears (x3), but it has worked great every time. I don't go in the woods without EMT gel. "Great stuff. Also use it on horse where it works very well." Great stuff. Also use it on horse where it works very well. You use very little in most cases so a tube lasts a long time. "This stuff is the bomb." This stuff is the bomb. My wife who own a Vet clinic was amazed with it's results as was I! "I like the fact that I can carry this product with me into the hunting and training fields alike and feel confident that if an accident occurs, I can stop deep cut bleeding right away." I like the fact that I can carry this product with me into the hunting and training fields alike and feel confident that if an accident occurs, I can stop deep cut bleeding right away. Luckily, I have not had to use it yet but it is in my dog first aid kit and the kit goes everywhere with me. "Seemed to expedite healing time"
"Doesn't clot blood as good as it could." Runnning hunt tests, waterfowl hunting and doing retriever demo's with two dogs, I have had several occasions to use EMT Gel on cut pads, ears, tails and skinned elbows. This stuff is great as long as the bleeding isn't to profuse. Doesn't clot blood as good as it could. If the bleeding is somewhat heavy ie. a cut ear, the product is slow to dry and seal the wound. "Removed the inflammation from the foot wound quickly." Removed the inflammation from the foot wound quickly. I used a cotton sock on the wound the first time to protect it and the sock stuck to the wound. The sock was difficult to get off and some skin came off with it. I used a gauze pad under the sock on the other treatments and the gauze pad did not stick to the wound. The foot healed in four days. "Sticky and messy to work with but that is part of what makes it work so well at closing wounds." Sticky and messy to work with but that is part of what makes it work so well at closing wounds. I have used it multiple times with pretty good success. "It does not stop bleeding as well as I thought it should." Labs and Irish Red and White Setters. Hunts. Family pet. Competes. It does not stop bleeding as well as I thought it should. "The product was a bit runny, which I didn't like, and seemed like it would come off when she walked on the carpet." Xena had a wound on her paw from tracking. The product was a bit runny, which I didn't like, and seemed like it would come off when she walked on the carpet. I finally had to put Mushers on it to seal it in. I'm sure the product works great if put on an area other than the paws. EMT First-Aid Gel -- 1 oz. Canine "First Aid Kit in a Tube"
EMT Gel is the "First Aid Kit in a Tube." Applied to a wound, EMT Gel helps reduce bleeding, seals off nerve endings to diminish pain and itching, and forms a protective barrier over the wound that reduces the chance of infection. But EMT Gel does more. This breakthrough collagen formulation works with the body to speed new cell growth and healing. 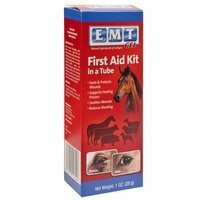 EMT Gel can be used on cuts, injured pads, burns, flesh tears, "hotspots", surgical sites, to assist healing when removing dew claws or docking tails, and for bleeders when trimming toenails. 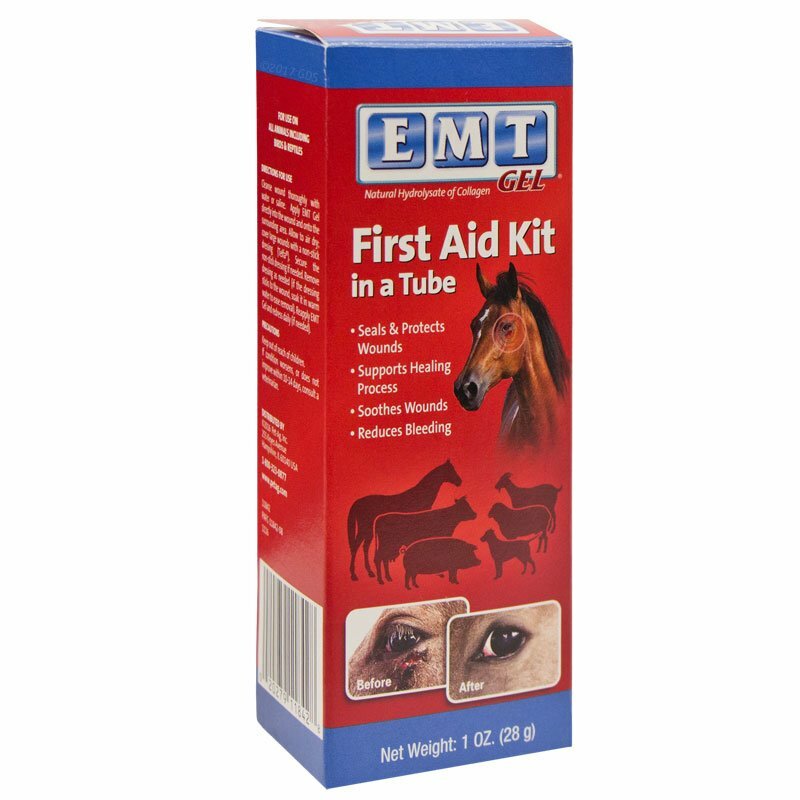 EMT Gel is safe for use on all animals. Apply EMT Gel directly into the wound and onto the surrounding area. Reapply EMT Gel and redress daily (if needed). If condition worsens, or does not improve within 10-14 days, consult a veterinarian.